Quinoa (KEEN-wah) is a protein packed ancient seed from South America, similar to the texture of brown rice when cooked with a nutty flavor. It contains all 9 essential amino acids, lysine, phosphorous, copper, iron and magnesium and it is easy to make. It’s not truly a grain, it’s actually a relative of spinach. It is recommended that you soak and rinse the seeds well before cooking. Once cooked the seeds expand about 4 times their original size, so 1 cup of uncooked quinoa seeds yields approximately 4 cups cooked quinoa. Preparation is simple, 1 cup quinoa, 2 cups water or broth and is done in about 15 minutes. Wash quinoa and add to a medium saucepan. Add water or broth, salt and boil, covered for 15 minutes or until all the water has absorbed. You will know when they are cooked when they are fluffy and you see a small thread. Fluff with a fork and it will be ready to use for other recipes. 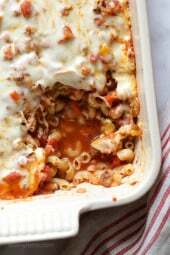 You can store it in the refrigerator for 3 or 4 days and reheat in the microwave. For the beef, potato and quinoa soup, can I use the red quinoa? I use less water. 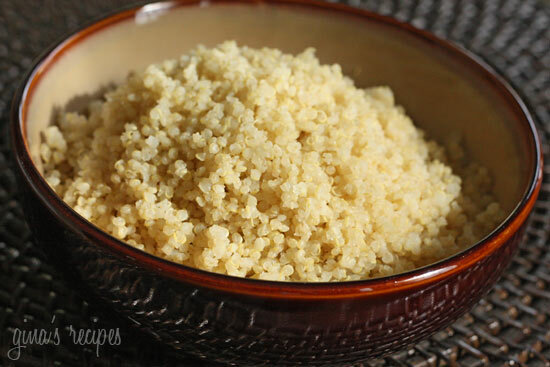 For 2 cups Quinoa — 2 1/4 cups water. Works great, nice & fluffy. you have to cook it longer than 15 minutes…it took about 17 – 18 minutes until all the liquid is absorbed. I soaked, rinsed, and boiled my quinoa in chicken broth. When I tried eating it, every 5 or so bites had a gritty taste like there was sand or something in it. Anybody else had this before? The quinoa was from the bulk section of the local Sprouts (health food store.) I hate that gritty feeling so bad that I feel sick even thinking about trying again. I have the same problem with the bag that I bought from Costco. The taste of sand or glass under my teeth is awful! I like quinoa and I didn't have that problems with other bags that I bought from Costco previously.. I just made some warm quinoa salad and on reading this, I was surprised that no one mentions sprouting the quinoa? Not to direct people away from this fabulous blog, but since we all learn from each other, if anyone is interested, check out (read: google) "warm quinoa salad jules stonesoup" for the recipe I made incl sprouting tips (her directions are very simple and sprouting is super easy!). It was lovely! But once you're done, dont forget to come back to skinnytaste cos there are lots of recipes here too which are awesome! WAlmart certainly does carry quinoa as do they goat cheese and hummus. Maybe you need to look instead of depending on a teenage stock boy to do your work for you!!! Different Wal-Marts carry different things, depending on what will sell there. Also, it's been two years since that person posted…a lot has changed in the food industry since then. More natural and alternative choices are available now because of demand. No need to be cranky about it. I wish I would have read this before I cooked mine. Followed the box directions but I think I undercooked it. Still good, though! I'm a chef and cook Quinoa every day. It's one of the easiest ingredients I've ever worked with. The reason you rinse it is because there's a fine resin on the seeds. If not rined well before cooking, your Quinoa may taste bitter. Take a metal-mesh strainer and rinse your Quinoa under cold water for about 5 – 10 minutes. Bring your water to a boil, 2 cups water to 1 cup uncooked Quinoa, put the Quinoa in the water once you see a boil, cover and reduce heat to simmer. 15 minutes later, your Quinoa is cooked…the Quinoa looks like ant hills in the pot when done! Fluff with fork and add anything you like to make a great salad! Where is your quinoa from? I bought some at Trader Joes's and it's 4points for 1/4 cup. 4 pt+ for 1/4 raw which = 1 cup cooked. I think of it as 1 pt+ for each 1/4 cup cooked. I love Quinoa! I buy it at Walmart in a box. It's the kind that doesn't have to be rinsed. Thanks Gina for all the great recipes!! I am curious. Why do you rinse the Quinoa? I bought a big bag at Costco. It does not say to rinse it in the cooking directions. Can you replace this for rice in a butternut squash risotto recipe? Does anyone know the points+ calculation for quinoa? This is a definate try! I make rice for daughter all the time. She does not like brown rice..heck not sure If I am even making it right..lol. Definately will have to get some. Will use it for my homemade chicken soup she loves. Autum is coming already! I've been using Quinoa for many years. I'm sure Wal-Mart has never heard of it, like the time I asked for hummus and goat cheese, the guy looked at me like I was from Mars. Buy in bulk from health food stores or any large grocery store that has an organic section. Boxed costs more. I don't like the red kind, it's chewier, while the white kind is very soft. Anyway, do not soak it. Simply bring 2 cups of water to a boil, add 1 cup quinoa, and simmer on low for TEN minutes, maybe less. When you see the cute curly cues have popped out of the kernel, it's done. Look up Quinoa on Wikipedia. 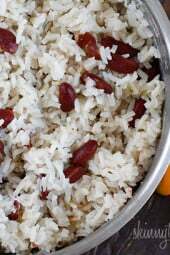 It's the most nutritious grain, highest in protein, and some cultures call it "The Grain of the Gods". It is also less acidic than other grains, gluten-free and easier to digest. I choose it every time. Thanks Merrigold! I've never made it in soup, but that sounds like a fantastic idea!! Quinoa is high in protein & is good as a "rice" replacement or in soups or even in puddings. It takes on the taste of whatever you put it into. We can get it at Costco here in Alberta, Canada. Thanks Lynette, I'm one of those people who can only make rice on the stove, but I know a lot of people swear by their rice cooker. I am excited to find your site and more recipes for Quinoa. My family LOVES it. We use our rice cooker to make it and I do use various broths when I make plain Quinoa depending on the protein I may be serving with it. I also like the red Quinoa variety. We buy it in bulk at our health food store. I am going to try your Quinoa "Fried Rice" recipe. I buy mine in the supermarket, but I think it depends on where you live. Trader Joes sells it, as well as health food stores. where can i find Quinoa? at regular grocery like walmart? 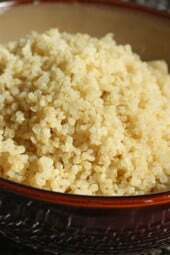 To Make quinoa taste better cook it with broth instead of water and flavor it the same way you would falvor rice. Quinoa cooks just like rice. Quick tip – Red quinoa is better for you that regular quinoa. You can buy it at Trader Joes. I used a rice cooker and it turned out fine except that the bottom layer got browner than the rest. It was tasty, not burnt. Two to one ratio of water and quinoa. Good question! I don't use a rice cooker but I'm sure it would work. You may need to add more liquid though, I'm not sure. Is this somehow the same way you cook regular white rice? Can I use rice cooker for this? No, quinoa is different. Give it a try, it's good! dumb question! is this the same as coucous???? That lemon chicken sounds wonderful! @ Barb – maybe it needed to cook longer. I'm very excited to see a quinoa recipe for ww. My partner makes a delicious lemon chicken (tagine) and its great with quinoa. Looks like you have a few things I'm going to need to try! So far I have not had good results with this. What am I doing wrong? How long do you soak for? It looks so nice and fluffy. Can this be found in your average grocery store? Does it have a strong flavor? 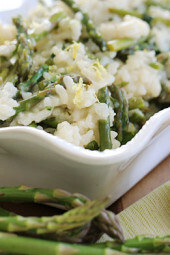 I am going to post an easy quinoa risotto recipe using the homemade sauce that will be ready in 5 minutes! I’m gonna try to play with this a little more. I’ve been “scared” of it -lol- but made some quinoa granola the other day that was really tasty! Thanks for the background info; never knew it was a relative of spinach! So what kind of recipes do you make with quinoa?